Boasting outstanding review scores from media across the globe and a current Metacritic score of 82, Shantae and the Pirate’s Curse on Nintendo 3DS from Rising Star Games marks the first time a Shantae game will be made available to players as a physical release in over a decade. 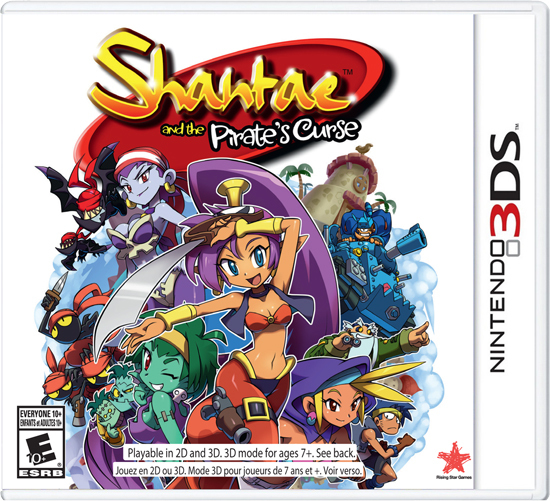 And what’s more, the boxed version of Shantae and the Pirate’s Curse features new content not available in any previously released version. In Shantae’s third and biggest adventure to date, the hair-whipping belly dancing genie must team up with her arch-nemesis, the nefarious Risky Boots, in order to save Sequin Land from an evil curse. By becoming a pirate, Shantae gains new weapons she can use to solve fiendish puzzles and battle fierce bosses. In a game already packed with thrilling content, the physical boxed retail release also includes “Super Shantae Nab! !”, a new arcade-style game exclusive to this release. Developed by WayForward and published by Rising Star Games, the physical boxed edition of Shantae and the Pirate’s Curse for Nintendo 3DS family of systems is priced $29.99/£29.99/€29.99.